The UXSG conference was a space for the Tusitala team to connect with and learn from fellow UX enthusiasts. Over the many talks, workshops and meals across three days, we found opportunities to rethink and uncover facets of UX and its impact. User Experience, we glean, isn’t restricted to design – it transforms the way many of us live and do our jobs in a connected world. It informs the way we create experiences with people, places and objects around us. Here are three ideas we took away from the UXSG conference that we believe will make a difference to how you approach your next challenge. As designers, we often work towards a solution that aims to solve a problem or to improve people’s lives at a level that is apparent to the eyes and to the mind. It’s what what we see and what we think. However, the opening keynote by Tong Yee of The Thought Collective brought a new perspective to me. He encouraged UX designers to use our ears and our heart. Listen to the narrative that makes a difference to the people that we are designing for. Connect with their emotions, and look out for the anger, fear or sadness. When we know truly understand the emotion, our UX design would be more effective. “Stress arises when you are trying to be the person that you are not…” This is one of today’s take away from the closing session of #uxsg. 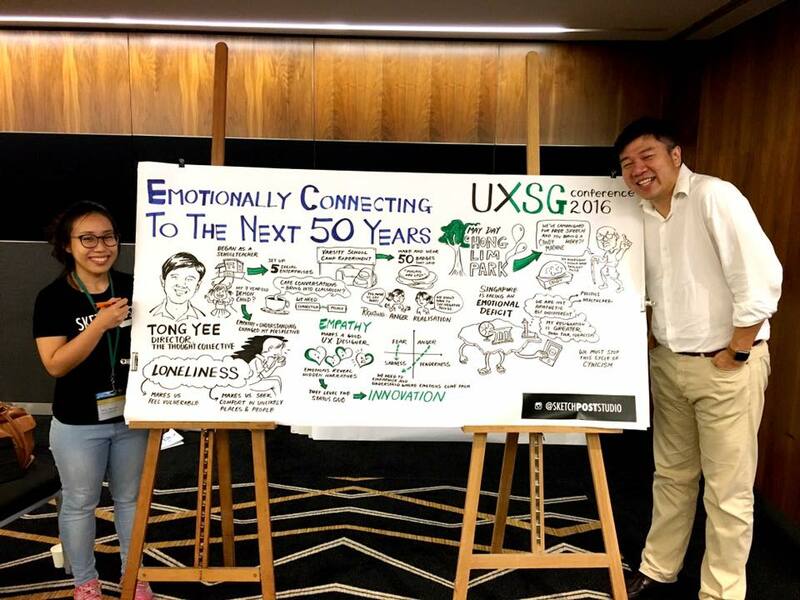 The theme for this year’s UXSG Conference was Transformation. Venerable Chuan Guan’s session was delightful – full of wisdom on mindfulness and emptying oneself to achieve transformation. The session highlighted the importance of unpacking who we are, the roles we play, and realising that these roles do not define us. Working from these principles, we can remove ourselves from the equation by taking away biases, becoming truly effective designers. Of the different tools and methods that speaker Miriam Walker shared, one that stood out for me most as the Personal Journey Map. We start with a real experience of a targeted user and walk through what the person recently experienced. The main insights are what the user’s emotion was during key points. When we identify what are the user’s pain points in their journey, we can design a better UX from their real experiences.